There are a number of principles that are central to hermeneutics. Each of these will be expounded and explained here. PRINCIPLE #1: Context, context, context! We hate to be taken out of context when we speak. Often, enemies can do this on purpose to make you look cruel, insensitive, or stupid. Well, if we hate to be taken out of context, imagine how God feels when we do this with his word! Context is the primary rule of interpretation, trumping all others. If we believe that there is a break of context, then the full burden of proof rests on us to demonstrate this. For instance, imagine if someone told you, “I saw your wife kissing a man in bed this week.” When you call your wife, you find out that the context was that she was kissing her elderly father on the forehead in his hospital bed. Likewise, when people misconstrue Scripture, we have to ask, “Was this an accident, or were they intentionally violating the context?” For instance, imagine if someone said that the Bible teaches, “There is no God” (Ps. 14:1). If we read this in isolation, we might believe that the Bible is an atheistic text! However, when we read the context, we find that David writes, “The fool has said in his heart, ‘There is no God.’” This context changes the message considerably. If we allow Scripture to contradict itself, then we will have absolutely no restraint on our interpretation. Not only is this logically fallacious (violating the law of non-contradiction), but this would also lead to absurd conclusions. For instance, the Bible teaches that God has an “arm” (Deut. 7:19), “wings” (Ps. 91:4), “nostrils” (2 Sam. 22:9), “mouth” (2 Sam. 22:9), and “eyes” (Heb. 4:13). But it also teaches that “God is spirit” (Jn. 4:24). Without a basic conviction to harmonize these concepts, we might conceive of God as a humanoid, fire-breathing monster! But when we allow Scripture to harmonize with Scripture, we can discern metaphor from didactic teaching. Moreover, since God cannot lie (Heb. 6:18; Titus 1:2), he therefore cannot contradict himself. We find it to be theologically disturbing to think of God contradicting himself all over the Bible (Heb. 6:18; Titus 1:2). To practice this principle, the interpreter needs to discover the allowable range of meaning for each passage, and then choose the interpretation that doesn’t contradict other scriptures. When critical scholars find difficulties in Scripture, they automatically assume that these are contradictions. But compare this with other academic disciplines. When a scientist comes across a scientific abnormality, it encourages her to investigate more—not less. If she found a difficulty in the scientific data, she would never throw up her hands in defeat and say, “Well, I guess there’s no way to harmonize this contradiction. I guess it’s time to go back to school for business…” Instead, these scientific difficulties would lead her to further theories and discoveries. In the same way, difficulties in the Bible should lead us to more investigation, rather than less. Conservative scholars are more intellectual in this sense, because their commitment to the truth of the text causes them to investigate further, rather than just throwing their hands up and calling for contradictions. Take a classic example of this: The apostle James writes, “You see that a man is justified by works and not by faith alone” (Jas. 2:24). However, the rest of the epistles teach faith apart from works. Since Scripture cannot contradict Scripture, we need to find another possible way to understand James’ words. In this case, building from the context, we see that James is referring to justification before men, whereas Paul is referring to justification before God (see comments on James 2:14-26). We see secular parallels to this methodology in atheist Richard Carrier’s book Sense and Goodness Without God. In his book, Carrier implores his readers to give him “interpretive charity.” He writes, “If what I say anywhere in this book appears to contradict, directly or indirectly, something else I say here, the principle of interpretive charity should be applied: assume you are misreading the meaning of what I said in each or either case.” If atheist books can be misunderstood, then can’t the Bible? If we should give a modern author like Carrier “interpretive charity,” how much more should we give an ancient text like the Bible the benefit of the doubt? Ironically (or should I say hypocritically? ), Carrier extends no such generosity to the Bible. Apologist Norman Geisler tells a story about one of his colleagues, whose mother had died in a car accident. The man received two phone calls about his mother. The first call told him that his mother was in a car accident, and she was being driven to the hospital in critical condition. The second call told him that his mother was in a car accident, and she was killed on impact. The man was confused, because they were both trustworthy people. He knew that neither person would lie to him, but at the same time, they appeared to completely contradict each other. As it turned out, the man’s mother had been in two accidents. The first accident left her in critical condition. The ambulance picked her up and drove her to the hospital. As she was being rushed to the hospital, the ambulance got in a second accident, and she was killed on impact. Of course, if a Bible commentator offered a solution like this for a biblical difficulty, he would probably be laughed at. And yet experience demonstrates that these sorts of events are certainly possible. God’s purposes for humans have never changed, but his methods have. Consider a parent-child relationship. The parent always has the purpose of raising her child into an independent adult, but her methods may change. When a child is a toddler, the parent might instruct the child to grab their macaroni and cheese with their fingers and shovel it into their mouth. But when the child is a teenager, they might not tolerate such a thing at the dinner table. The parent’s purpose never changed (e.g. raising the child into an independent adult), but her methods did (e.g. using fingers versus using a fork). Similarly, the author of Hebrews states that God formerly worked through the prophets, but he worked fully in his Son (Heb. 1:1-2). This explains why many teachings are partially concealed in the Old Testament, but fully revealed in the New Testament. For example, while the resurrection of the dead is taught in the OT in a few passages (Isa. 26:19; Dan. 12:2; Job 19:25), it is taught extensively in the NT. (1) The Temple: The psalmist, “My soul longed and even yearned for the courts of the Lord” (Ps. 84:2). But in the new covenant, the temple has been abrogated (Heb. 10), because believers are the new temple (1 Cor. 3:16; 6:19). (2) Sealing of the Holy Spirit: David prays, “Do not take Your Holy Spirit from me” (Ps. 51:11), but a new covenant believer would never pray like this, because we are “sealed” with the Holy Spirit (Eph. 1:13-14; 4:30). (3) The law: Jesus was born “under the law” (Gal. 4:4), but new covenant believers are no longer under law (Rom. 6:14; 7:6). (4) Government: While theocracy was commanded in OT, secular government is affirmed in the NT (Rom. 13:1-7; Mt. 22:21; Jn. 18:36). Finally, animal sacrifices, dietary laws, Sabbaths, holy days, festivals, priests and liturgy have all been fulfilled in Christ and are thus obsolete (Col. 2:16-17; Heb. 8). Being cognizant of this shift in covenants can explain why Jesus’ teaching appears to contradict Paul’s in many instances: Jesus was an old covenant preacher, while Paul was a new covenant preacher. Since the Cross hadn’t historically occurred, Jesus was still was preaching in the old covenant (see comments on “How do we interpret the Sermon on the Mount?”). Not everything in Scripture is equally clear. For instance, Peter said that some of Paul’s writings were “hard to understand” (2 Pet. 3:16). Thus we should discern what is clear in Scripture before building doctrines on unclear passages. In the Bible, the main things will no doubt be the plain things. For instance, Paul refers to some who were “baptized for the dead” (1 Cor. 15:29), and John refers to the “sin… leading to death” (1 Jn. 5:16). These concepts are not spoken of anywhere else in the Bible, so we should be reluctant to build major doctrines on such obscure, isolated, and difficult passages. We interpret the front page of the newspaper differently than we interpret the comic section; likewise, we interpret poetry differently than history. There are multiple genres of literature in the Bible: Poetry, wisdom, apocalyptic, history, epistle, etc. Understanding genre is crucial to interpreting the Scripture. Consider an example: We read in the Proverbs, “A gentle answer turns away wrath, but a harsh word stirs up anger” (Prov. 15:1). The genre here is wisdom literature. These are general maxims—not universally binding laws. That is, in wisdom literature, it is generally true that a “gentle answer turns away wrath,” but this isn’t always true. A skeptic might see this as an error in Scripture, but when we understand the genre of literature, we see that this is unreasonable. Likewise, Revelation states that a sword protruded out of Jesus’ mouth (Rev. 1:16). Because Revelation was written in the apocalyptic genre, we shouldn’t interpret this passage as Jesus choking on a sword. Rather, this is symbolic for him speaking the word of God (Heb. 4:12). No historical or news reports are exhaustive. In fact, it would be impossible to communicate with one another, if we needed to speak exhaustively or completely. John writes that the NT authors needed to be terse, because they wanted their books to be manageable for believers (Jn. 21:25) and non-believers (Jn. 20:30-31) to actually read. While Matthew records two demon-possessed men (Mt. 8:28), Luke only mentions one (Lk. 8:27). Note that Luke never says that there was only one man. Instead, he only gives a partial report, whereas Matthew gives the full report. If we were in a court of law, we might hear a person truthfully and inerrantly summarize a defendant’s words or deeds. Poythress writes, “A witness on the stand may testify that he heard the accused person make a promise: ‘John told Donna that he would pay it all back in a week.’ The defense attorney says, ‘Were those his exact words?’ The witness can truthfully answer, ‘No, but that is what he said.’ In other words, the witness is not claiming to give the exact wording, but he is claiming to give the meaning.” The CSBI allows for “free citations” of other passages—specifically the OT (Article XIII). Jesus was an itinerant preacher, who travelled all around Israel. Can we really expect him to have created entirely new teachings for each new place he spoke? Why would we expect this? He surely repeated some of his teachings over and over. Consider Jesus’ oft-repeated riddle, “For whoever wishes to save his life will lose it; but whoever loses his life for My sake will find it” (Mt. 16:25). This statement appears in all four gospels at least once (Mt. 16:25; Mk. 8:35; Lk. 9:24; Jn. 12:25), but it appears in Matthew twice (Mt. 10:39; 16:25) and Luke twice (Lk. 9:24; 17:33). This proves beyond a shadow of a doubt that Jesus repeated his teachings, because the same author will repeat the same teaching in the same gospel. Based on this, when we see teachings that contradict one another in ordering or wording, it was most likely the case that Jesus gave this teaching more than once. We see this in Jesus’ Sermon on the Mount (Mt. 5-7), which is similar but different from his Sermon the Plain (Lk. 6). Likewise, when Mary dumps her perfume on Jesus’ feet (Jn. 12; Mt. 26; Mk. 14), this is probably a different from the event in Luke 7. Ancient historians did not hold chronological ordering as a priority. For instance, if someone asked you, “How was high school for you?” You might say, “I graduated with a 4.0, I played football my sophomore year, and I was in a major car accident when I got my license.” Of course, this account is not chronological. But based on this, would it be reasonable for them to call you a liar for recounting your experience in this way? Of course not. We can record events topically and still tell them truly. NT scholar Richard Longenecker notes that almost all ancient historians wrote topically, rather than chronologically. He writes, “In writing their histories the ancients frequently grouped their material per species, without always specifying chronological relationships.” He cites a number of examples of ancient historians who adopted this view: (1) Satyrus’ Life of Euripides, (2) Plutarch’s Parallel Lives, (3) all Roman historians besides Tacitus, and (4) Suetonius’ Augustus. Since God cannot lie (Heb. 6:18; Titus 1:2; Rom. 3:4) and the Bible is the Word of God (2 Tim. 3:16; 2 Pet. 1:20-21), it makes logical sense that the Bible is completely inspired and without error (Jn. 17:17; Ps. 119:160). In fact, this is the affirmation of Scripture itself. The psalmist writes, “The words of the Lord are pure words; as silver tried in a furnace on the earth, refined seven times” (Ps. 12:6). Solomon writes, “Every word of God proves true” (Prov. 30:5). From biblical affirmations like these, Christian theologians have concluded the doctrine of inerrancy (see “Inerrancy”). Poythress, Vern S. Inerrancy and the Gospels: A God-centered Approach to the Challenges of Harmonization. Wheaton, IL: Crossway, 2012. Poythress is a Reformed presuppositionalist. His book is excellent on the principles of inerrancy in the gospels. He even spends entire chapters working through particularly difficult passages or alleged contradictions. Holding is an internet apologist who has a wealth of answers to Bible difficulties. We disagree with him on Preterism, his belief in a Young Earth, and his views on genre criticism. But his website is extensive on Bible difficulties, and he has good material to consult and consider. 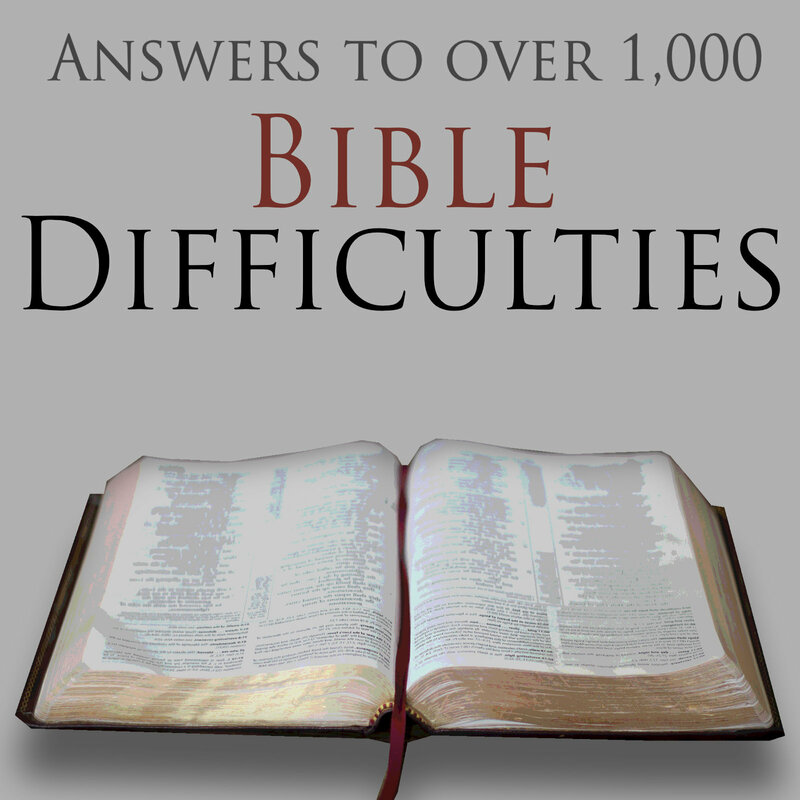 This site has an extensive resource of Bible difficulties. We disagree with Apologetics Press on baptismal regeneration and their belief in a Young Earth, but their site is an excellent resource for answers to Bible difficulties. Emphasis mine. Carrier, Richard. Sense and Goodness Without God: A Defense of Metaphysical Naturalism. Bloomington, IN: Authorhouse, 2005. 5-6. I am indebted to one of Dr. Norman Geisler’s excellent teaching tapes on the subject of inerrancy for this helpful illustration. Hemer, Colin J. The Book of Acts in the Setting of Hellenistic History. Winona Lake, IN: Eisenbrauns, 2001. 101. William M. Ramsay, St. Paul the Traveller and the Roman Citizen, p.8. Cited in Yamauchi, Edwin M. The Stones and the Scriptures. Philadelphia: Lippincott, 1972. 95. Blomberg, Craig. The Historical Reliability of John’s Gospel: Issues & Commentary. Downers Grove, IL: InterVarsity, 2002. 109. J.P. Free, Archaeology and Bible History (Wheaton, Illinois: Scripture Press Publication, Inc., 1973) 1. Poythress, Vern S. Inerrancy and the Gospels: A God-centered Approach to the Challenges of Harmonization. Wheaton, IL: Crossway, 2012. 167. Poythress, Vern S. Inerrancy and the Gospels: A God-centered Approach to the Challenges of Harmonization. Wheaton, IL: Crossway, 2012. 129. Longenecker, Richard. The Acts of the Apostles. In F. E. Gaebelein (Ed. ), The Expositor’s Bible Commentary, Volume 9: John and Acts (F. E. Gaebelein, Ed.). Grand Rapids, MI: Zondervan Publishing House. 1981. 213. Poythress, Vern S. Inerrancy and the Gospels: A God-centered Approach to the Challenges of Harmonization. Wheaton, IL: Crossway, 2012. 32.